NOTE: Information in this post is valid as of 12/10/2014! Information is subject to change in the future. This is to provide a general overview of the O365 Admin Portal for folks that are using Power BI and may not be familiar with the O365 aspects of the service. There are times when we will need to use the O365 Admin Portal for either account management or for configuring SharePoint Online. Before we get into the admin portal, please have a look at the following blog which discusses the Subscription options for Power BI. 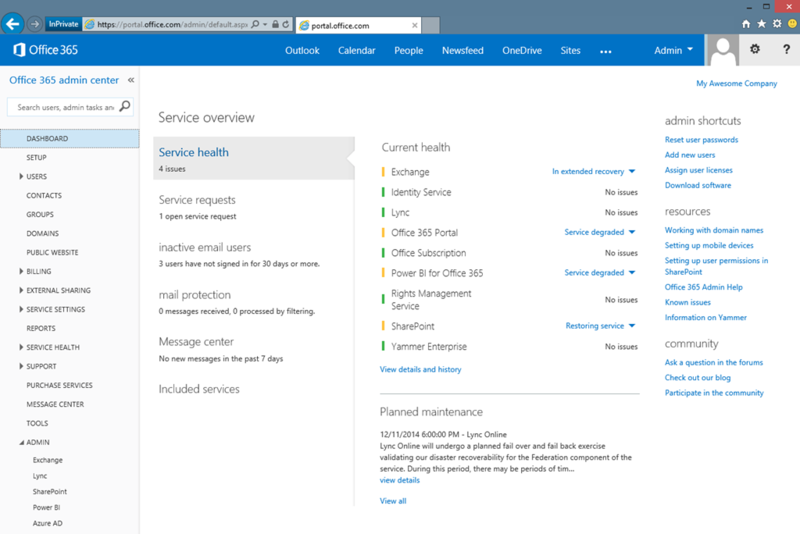 The O365 Admin Portal provides information regarding your Tenant. You will need to have Admin access to view and/or modify items within the Portal. 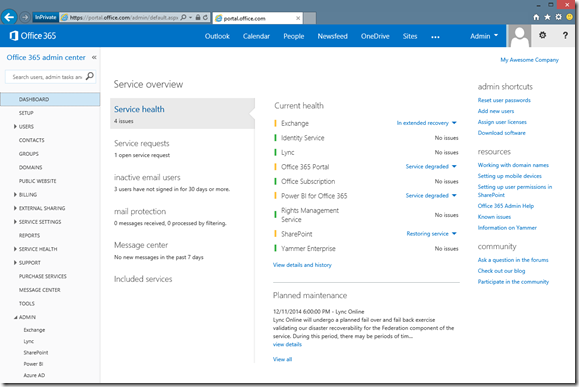 When you first go to the Portal, it will display the Service Overview along with the current Health of services. From a Power BI perspective, I’m really interested in two areas within the O365 Admin Portal. Those are Billing and users. Within Billing, we will have two sections. Subscriptions and Licenses. The Subscriptions view lets us see what Subscriptions we have for our Tenant. It will also show the status, number of licenses, any cost associated to it and the Expiration time for that subscription. Here we see 3 subscriptions. If you have an existing E3 Subscription, and choose the Power BI Add-on, the above is what you will see. If you just choose the Power BI Standalone subscription, the only item you would see is Power BI for Office 365 without the other subscriptions. 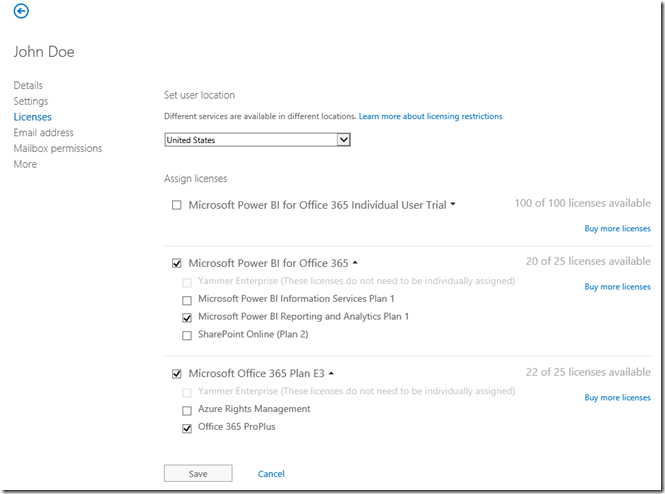 Power BI for Office 365 includes a SharePoint Online Plan 2 as part of it and is a requirement for Power BI. The Licenses section shows us the number of licenses we have, how many have expired and how many are assigned. It will also provide a status if one is needed. One thing to notice here is the Microsoft Power BI for Office 365 Individual User Trial. We didn’t see this in Subscriptions because it isn’t actually a subscription. This is part of the Information Worker user adoption program for O365. This is not a normal license for Power BI and has some restrictions. For example, a user with the Individual User Trial will not be able to use the Power BI Admin area. The Users area within the port has a few sub areas. We will focus on the Active Users. Here we can see a list of users for the O365 Tenant. These are not specific to Power BI, but for all of the tenant. For each user, we can assign licenses to them which enable them to use certain aspects of their Tenant. We can adjust the Licenses in two areas. The first is just click Edit for that user after you have selected it. The second is by clicking Edit under the Assigned License section after selecting that user. If you have a lot of subscriptions/licenses, you may just want to edit the whole user to get a bigger view of the license area. When we look at that user, we can click on the Licenses section on the left. This will show us what License options we have to assign to the user. It will also show us what is currently assigned. For each license section, you will be able to expand that section to see sub-items. For Power BI, we will see four. Yammer Enterprise will always be greyed out. The actual Power BI items are the following. These two items control access to Power BI and are what is checked when accessing areas. 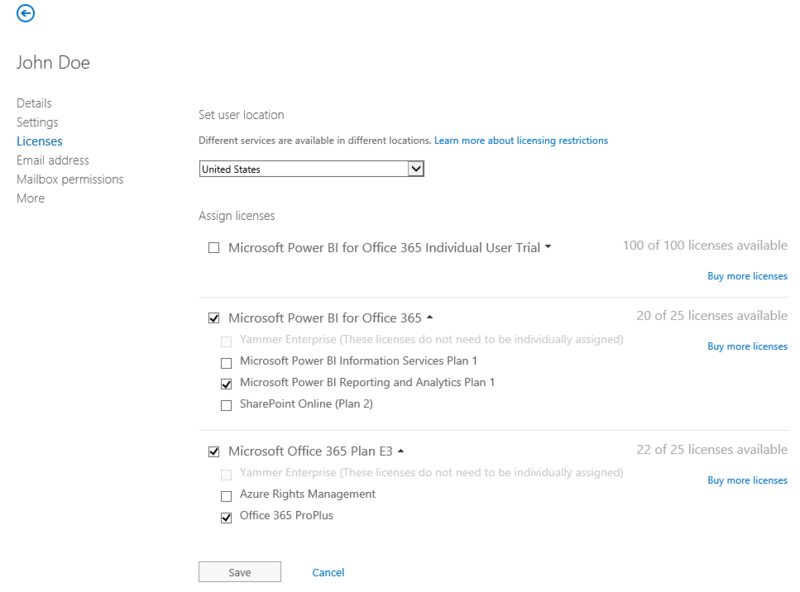 If you only choose the top item Microsoft Power BI for Office 365 and do not select either the Information Services or Reporting and Analytics item, they will not be able to access Power BI. Reporting and Analytics is used for items such as the Power BI Sites, Power View and Q&A. SharePoint Online (Plan 2) is included with the Microsoft Power BI for Office 365 subscription. If you have an E3 subscription as well, I recommend selecting SharePoint Online from that subscription and not the Power BI subscription. It really doesn’t matter, and you have to have SharePoint Online available for a user to use Power BI. Also, you cannot select SharePoint Online in both. You have to pick one. You will receive an error if you try to select multiples. Hopefully this will help you understand what is needed for a user to use Power BI for Office 365.